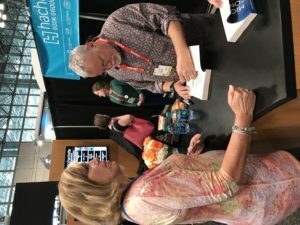 Book Expo America…a book lovers dream! In 2017, before Lottie Loser was released, I was given tickets to BEA in New York City. An opportunity to see my book on display at the country’s biggest book venue? No way was I not going to attend. So, The Captain and I made our plans and traveled to the Big Apple in late May for a week of books, books and more books! With a few authors and other celebrities thrown in. 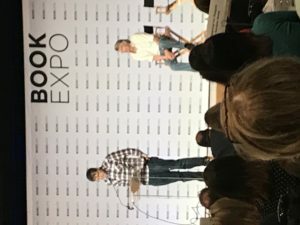 On the first day we were invited to a breakfast where author Stephen King, actress and producer Whitney Cummins, photographer Pete Souza, astronaut Scott Kelly and author Jesmyn Ward spoke. It was magical. Listening to this illustrious group discuss their past writing, as well as the books they were presenting that week was every aspiring writers dream. I left there more determined than ever to become a real author. It was also in New York where I first met Mark Wayne Adams. I had read a pre-BEA article from Mark, where he talked about the Florida Authors and Publishers Association, and that article is what encouraged me to enter their 2017 Presidential Awards. Lottie Loser went on to win a Silver Medal that year, and I will be forever grateful to him for pointing a brand new author in the right direction. 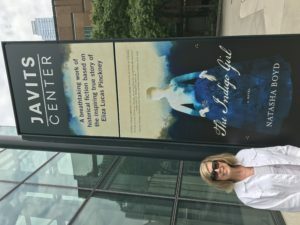 When the idea for this Blogpost came to mind I got to thinking about how many of the events from that week in New York appear in my books. In Call Me Charlotte, there’s a scene where Charlotte buys Nick the first two books in the Harry Boesch series by Michael Connelly. I actually met Mr. Connelly that year at BEA and have a picture and signed book to commemorate the day. His books are so well written and thought through, and I’ve read and loved every one. You all know that I’m a voracious reader, and although I like most genres, romance has a special place in my heart. That’s why meeting Elin Hildebrand at BEA was so exciting. I waited in a long long to meet her, and get a signed copy of The Identicals, but I also got a cold Corona with a slice of lime and cookies decorated with covers of other books of her’s. If I’m ever rich and famous, that’s my goal for book signings! In The Greysons you’ll find several of my actual experiences from that New York trip written into the book. I’m not going to tell you what they are, but instead hope that you will comment through my website with your ideas. I hope someday to go to another BEA New York, and to live the life of an urbanite, even if only for a week. 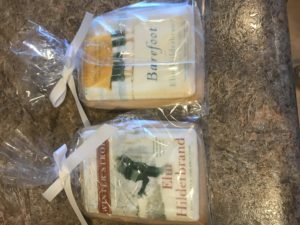 But in the meantime I’m going to keep writing and work towards my book signing goal; cookies decorated with the covers of my books! Me with Michael Connelly and Elin Hildebrands cookies!